I like to consider the Adige Cycling Path the most popular bike route that no one knows about. While our group of ten cyclists met cycling clubs; bike groups from other countries; school classes on bikes and plenty of local riders but only two others from North America. What those bicycle touring are missing is a route that starts in Austria as the Etsch Radweg. 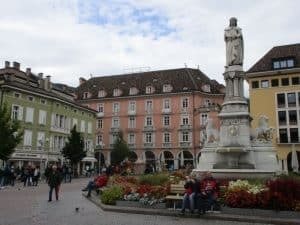 However to skip some mountain sections we joined the route in the spa town of Merano located in the German speaking region of Italy getting there by taking a local train. Our accommodation, the Albergo alla Torre Siegler im Thurm hotel had a lively bar, was located close to the bike route and there was a nearby bicycle shop, a winning combination. And when checking in they asked if we would be joining them for dinner which turned out to be excellent value. 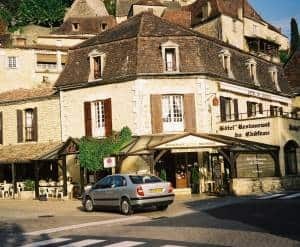 We were using rental bicycles which were delivered right to the hotel and stored in the underground garage along with plenty of bikes from other guests. Getting a group of ten cyclists going the first day with panniers can take a bit of time as everyone fiddles around. The section of the Adige cycling path from Merano to Verona is flat and takes about 3 days. 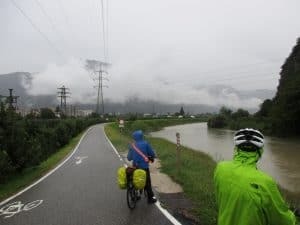 Our first day of cycling was to be a short 35 km as the group got used to riding with loaded panniers and was appreciated by everyone as it was raining hard. The route is paved for the entire distance and runs down the valley all the way to Verona, but today’s destination was Bolzano. 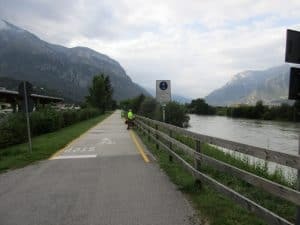 As it was well signed and flat it did not take much time to reach the outskirts of Bolzano where we joined the local bike network to reach the main square where we had our accommodation in the Stadt Hotel Citta. At our very elegant hotel we were surprised when very asked us just to roll our bicycles into the lobby and park them there with the other bicycles. All the hotels during our bicycle tour had been advised in advance we were arriving by bike and required storage. We loved Bolzano surrounded by the Dolomites and with its maze of pedestrian only streets and market. One of the main attractions is the South Tyrol Museum of Archaeology with the iceman exhibit (a murder committed centuries ago by cave men). For dinner out group went to a restaurant featuring an Austrian cuisine recommended by the hotel front desk and enjoyed wiener schnitzel, apple strudel and similar dishes. After a superb buffet breakfast the next day the sun came out as set off again down the Adige cycling path which was basically following the river by the same name. The scenery was awesome with mountains on both side and the main highway out of sight. The valley is covered with vineyards and apple orchards growing Granny Smiths which were being harvested during our September visit. There were a lot of riders out on this day and almost all seemed to stop at the bicycle café along the route. We continued into Trento and took a quick ride around town viewing the Palazzo Pretorio and Duomo in the main square before heading across the river and up a short steep hill to the Garni San Giorgio Della Scala. Although the owner did not speak English we settled into our rooms with a superb valley view before heading to the patio for a drink. 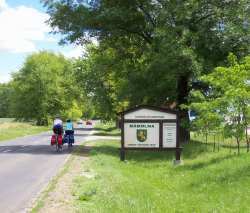 Others who were also bicycle touring also came up the hill and checked in. 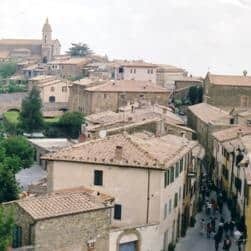 As the hotel has no restaurant we walked a short distance down the hill to one that catered to local citizens with classic Italian dishes. 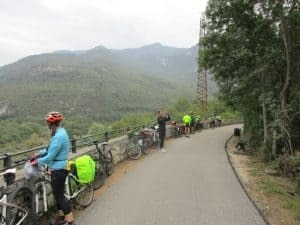 After breakfast in our hotel we loaded our bicycles with our lightweight panniers and headed back into Trento before rejoining the cycle route for our 53 km ride. Again it over flat terrain with mountains on both sides but we did stop to take photos of the Castel Baseno on the slopes to our left. Arriving in Rovereto the tourist office had set up an information booth beside the bike route for cyclists with maps and what to see in the area. After chatting with the helpful girl at the tourist booth we walked across the cobblestones to a the nearby café for a coffee and were joined by a large group of cyclists from the Netherlands. Then it was back on the riverside bike route until we reached the town of Mori. There the Adige Bike route continues to Verona however our group and it seems almost every other cyclist took the Pista Ciciabile Garda (also known as the Mori Cycle Track) to the west through the mountains. The Mori Cycle Track is a signed route that first goes through quiet streets in the town before heading along a paved bike path which parallels the only road through the gap in the mountains. It then splits from the road and heads into a forested park with a bit of a hill and superb views. You come out on top of a mountain with views of Lake Garda but we had to hurry as clouds were moving in and rain was in the forecast. 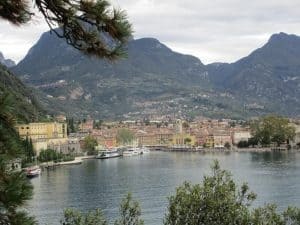 A long, long downhill ride brought us into the tourist town of Torbole located right on the lake. The bike route continues along a shared bike/pedestrian walkway along the shores of Lake Garda until reaching Riva del Garda where the route ends. Roads in this town were busy as we made our way to the Astoria Park Hotel & Spa, best known for its superb breakfasts. They had a huge bike lockup room as well. Riva del Garda has plenty of bike shops, lakeside cafes, a castle and is worthy of several days stay. A bicycle path is currently under construction around the entire lake to be finished by 2021. However, in the meantime we took the ferry to the south end and continued our bicycle tour of the Veneto. The Adige cycling route offers exceptional scenery, flat terrain for riding and is well signed with good pavement for very enjoyable riding (and no cars either)! Tom Oxby writes about worldwide adventure travel including bicycle touring and hiking. Easy Bicycle Touring Copyright © 2019.